Vero Beach woman tries to steal large TV at Walmart. VERO BEACH – There are some things a person can’t steal without prompting the attention of Walmart security at 5555 20th Street, according to the Indian River County Sheriff’s Office. 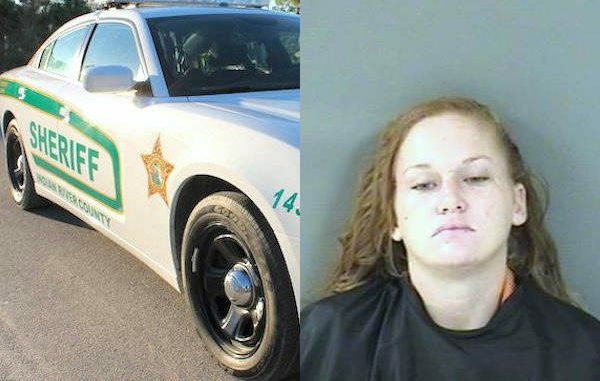 Kiley Michelle Yandle, 28, was observed by Walmart security in Vero Beach as she was behaving nervously in the electronics department, the report said. A loss prevention officer began to watch Yandle as she put a 40″ Samsung television, a headset, and various small items into a shopping cart. Soon after, Yandle was seen exiting the store after walking past all points of sale and attempting to leave without paying for the items in her cart, according to the report. The loss prevention officer stopped her, but she fled on foot. The total value of the stolen merchandise was $432.87. The officer called law enforcement and gave Yandle’s description, and the red Ford Ranger she left in. Within minutes, a deputy spotted the pickup truck and initiated a traffic stop. Yandle explained to the deputy she was just at Walmart, and a security officer tried to stop her, but she left because she didn’t do anything wrong, the arrest affidavit said. The security officer made a positive identification on Yandle and provided a copy of the video surveillance showing the attempted theft. Yandle was arrested on a charge of Retail Theft, and Felony Fraudulent Use of a Credit Card. According to jail records, Yandle has been arrested approximately 15 times in Vero Beach on various charges that include grand theft, probation violation, felony burglary, dealing in stolen property, criminal mischief, and shoplifting.